Fresh from their last gasp Europa League triumph over Liverpool Villarreal travelled to the Mestalla to take on rivals Valencia on Sunday evening. Whilst victory would assure Marcelino’s men a top 4 position and a Champions league qualification round entry, their rivals, meanwhile, have endured a bitter season having even flirted with relegation at times. Since taking over from the much maligned Gary Neville, Pako Ayestaran has set about improving Valencia’s possession game and some of their improvements were visible in this clash. The two 8s Parejo and Gomes were often initially positioned high and behind the midfield line of their opponents. Whilst many sides attempt to build through their deepest lying midfield players against Villarreal and struggle due to the strong covering from the forward players. Valencia used Javi Fuego (their 6) as something of a decoy. Positioned just in front of the two forwards he attracted their attention in the centre whilst the ball-near 8 would drop to the side of Villarreal’s front two. This movement allowed them to progress possession relatively easily due to Villarreal’s struggles in defending the half spaces. The dropping movements of the 8s left them out of the zonal control of the Villarreal midfield and the position-oriented defensive lines of the away side struggled to create access in the half spaces. With the 8s dropping Valencia could take full advantage of this in their build-up. There were one or two occasions where Villarreal attempted to use their wide players to press the Valencia 8s in the half spaces during their build-up. In these situations they would form a situational asymmetric 4-3-3 with the said wide player joining the front line and the remaining 3 midfielders occupying more central positions. However they still struggled to create access to the ball and the movement often created a disconnect between the ball-near wide player and ball-near central midfielder. Valencia were able to take advantage of this with the central movements of their wingers. This meant their attempts to establish access in these areas simply succeeded in allowing Valencia to exploit the half spaces in more advanced areas. In wider areas they demonstrated fairly impressive co-ordination in their movements and positioning. Whilst both the full-back and winger would at times be initially positioned on the same vertical line, when the ball reached one of them they would split and ensure this was no longer the case. At times this would be done with the full-backs running vertically on the flank thus releasing the wingers to move inwards diagonally. On other occasions (particularly down the left) the full backs were used as vertical runners in their respective half spaces with the wingers being the sole occupants of their respective wings. The effect of these schemes had implications for the style of attack they would execute in these situations. With the full-backs running through the half spaces they managed to affect the positions of Villarreal’s wide players and create isolations for Rodrigo and Mina. In these situations Valencia often looked to create crossing opportunities. These crosses were often swung deep towards the far post however they generally lacked effect. With Negredo often being the sole occupant of the box these crosses were more difficult to connect for obvious reasons. When the wingers moved infield diagonally they aimed to create structures that enabled effective combinations to take place. With these combinations they aimed to break through Villarreal’s defence directly. 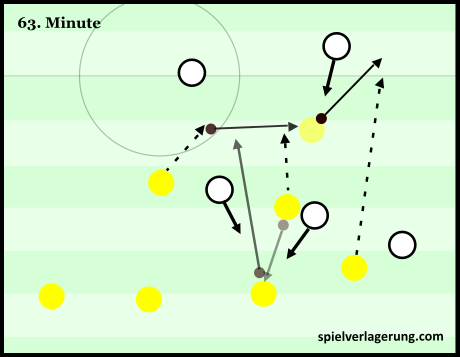 These movements were opposed to a more common strategy whereby players begin in the initial positions they aim to act in. It appeared to be a very deliberate attempt to provoke reactions from the away defence in order to elicit and take advantages of any mistakes Villarreal made in reacting to Valencia’s positional shifting. With the rotations occurring as the ball approached the wide areas they challenged Villarreal to re-organise themselves quickly against both the infield and outfield movement whilst attempting to create access to the ball. This dynamic positioning gave Valencia the chance to manipulate their opponents which, although not fully effective, they managed to do. Despite displaying a fairly high central focus in their initial positioning, Valencia’s possession game and focus in penetration was somewhat wing-oriented. Against Marcelino’s notoriously well organised side Valencia based their offensive strategy somewhat around the creation of overloads in wide areas. In football (like in most invasion games) the ball itself has notoriously magnet-like qualities. It is a major reference point for almost every defence as they aim either to regain possession of the ball or to restrict the space around the ball. Many intelligent offensive strategies therefore, are based around utilising these powerful attracting qualities of the ball to create space in other areas, this is fundamental to effective ball circulation. It is with this context that Guardiola explained the need for width if one aims to attack centrally and central occupation if one aims to attack through the flanks. One of the major differences in reaching the flanks by playing through opponents as opposed to around them is the increased space it will offer. By playing into an opposing defensive block a team can attract the opponents towards the ball and play the ball out of this pressure as it is coming in. However if one simply plays around the opponent they will simply be able to move towards the ball as it reaches the flank. This little temporal advantage that playing through an opponent often creates can be crucial due to the increased space it offers the recipient in the wide areas. Valencia displayed an inconsistent understanding of the need to circulate through Villlarreal’s block before reaching their desired wide areas. For long periods they would circulate the ball reaching the flanks by playing around Villarreal’s defensive lines which harmed their ability to even create the wide overloads they sought. By taking the long route around Villarreal to the flanks they gave the away side time to shift over and prepare for their defensive actions by creating strong defensive connections. Some of their best moments came when they were able to break through centrally before playing out to the flanks, however these were too few and far between. Part of the reason was of course due to their opponents who are renowned for defending the centre of the pitch imperiously. However it also seemed to be a strategic choice whereby they saw their best route of breaking through as combining in wide areas. This is demonstrable given that their positioning and movements could theoretically have given them the basis to penetrate centrally however they frequently decided against pursuing these opportunities. After an initial barren spell of around 15-20 minutes Villarreal looked capable of creating dangerous situations and chances on the counter attack. Part of it was down to the incompetence Valencia showed at times in defending these. However Villarreal also had some interesting and well co-ordinated movements in these situations which allowed them to take advantage of the opportunities Valencia threw up. One visible feature of their counters was the constant use of diagonal runs to get in behind. Particularly through Adrian, these diagonal runs helped Villarreal break past Valencia’s defensive line on a number of occasions. Adrian would constantly drift from central positions to the side of the ball in these situations. What this helped was Villarreal’s ability to create small overloads whereby a defender had to choose between tracking the runner or engaging the ball carrier. Of course neither choice was particularly desirable. At other points Adrian’s movement was so subtle and intelligent that the defenders in question were not even aware of his presence. In these situations they would push up to engage the ball carrier but lacked access due to the underload, and this movement only helped to create more room for Adrian in the next phase of the attack. On several occasions they also demonstrated some of the inherent advantages of a zonal defensive system for setting up counter attacking opportunities. Villarreal’s defensive orientation prioritises taking up strong positions in relation to the ball that allows the team to exert strong spatial control. They were thus often able to regain possession without a duel which would be far more difficult for a system based more around coverage of opponents. This gave the ball winner the space to initiate the counters. Furthermore the distance to their opponents made it more difficult for Valencia to create access in their counterpressing situations. Valencia were often seen attempting to counterpress but lacking access due to Villarreal shifting the ball before Valencia could make up the distances required to create this access. With Valencia often arriving to the ball’s location too late their failed attempts to counterpress created further space for Marcelino’s side to exploit. The same positioning in defensive phases that allowed Villarreal’s players to support each other in defensive actions allowed them to create the structures and options for their combinations. The consistency they exhibited in their defensive positioning gave them an almost instant awareness of the positioning of their team-mates. This helped quicken their decision making in combinations to initiate transition moments which was not only aesthetically pleasing but highly effective in bypassing Valencia’s counterpressing. Victory for the away side secured their position in the top 4 and they can begin planning for their participation in next year’s Champions League, their performance was all the more impressive given that they made 10 changes to Thursday’s team. Those preparations will surely be put on hold however given they are 90 minutes at Anfield away from the Europa League final which would be their first ever European final. Accomplishing this would top off what is already an excellent campaign under the impressive Marcelino. Valencia have endured a dire campaign with two managerial changes and woefully inconsistent performances, just months after the heady heights of a top 4 position and a place in the Champions League group stages. Under Ayestaran they have shown some good progression in their possession game and results with three consecutive wins. Whether this will warrant him being given the job on a full-time basis may depend on their results in the remaining games. Should he remain in charge, Valencia could well be an interesting team to watch next season.